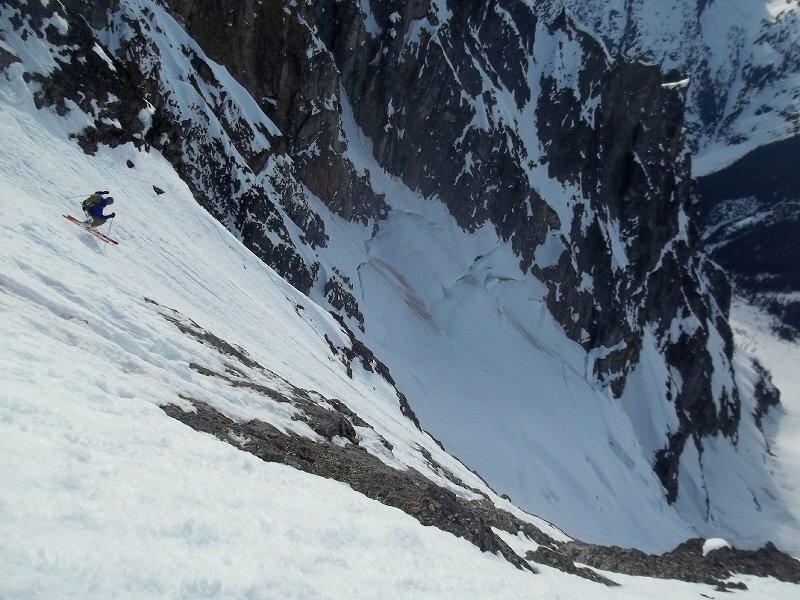 Dan Helmstadter and I enjoyed a ski of this steep face last Saturday.� On my trip to Arriva with the Miller bros a week before, I gawked at this face for several hours, wondering if it could be skied.� I knew Dan was the man for the mission, and our collaboration produced one of my most exceptional ski-mountaineering experiences--won't soon forget it. I posted some more words and pics�over here. ...is a damn good photo. Looks invigorating!� I don't think I'll need my second cup of coffee today after seeing those pics. I might not need that second cup of coffee. But I might need a diaper change! That looks poop-your-pants steep from the photos alone. Wow...steep...don't show those pictures to your Mother please. That's getting after it right there! Again....awesome guys. This one is a jewel. I remember Ross and I not having the guts to commit to this one in '04. I've wondered about it ever since. You guys proved to me that it's as steep as it looks. Epic! And awesome pics. Love 'em. Amazing and beautiful. You guys are not normal. Just looking down that side of Black Peak last Friday literally made my head spin. You two get the knarbar award of the year for sure! What's next? The N. Face of Big Four?!?! Holy smoke! 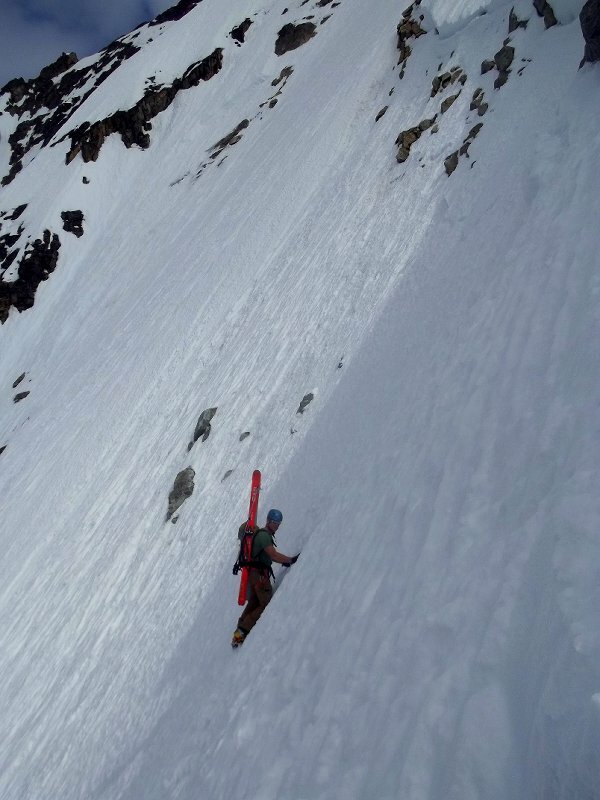 That is badass steep. Congratulations! Nice work E$ and Dan - I recall Skier 505 (Sjue) saying some time ago, a trip never seems to fail when Eric is along: Impressive in all regards. Yowza!! Incredible in every sense - looks like it might be the hardest ski descent in the state so far (and Dan would know), along with fantastic pictures. You've got to write this one up for publication. Thanks for sharing. Looks like you guys skied it prety darn well too! Bravo!! 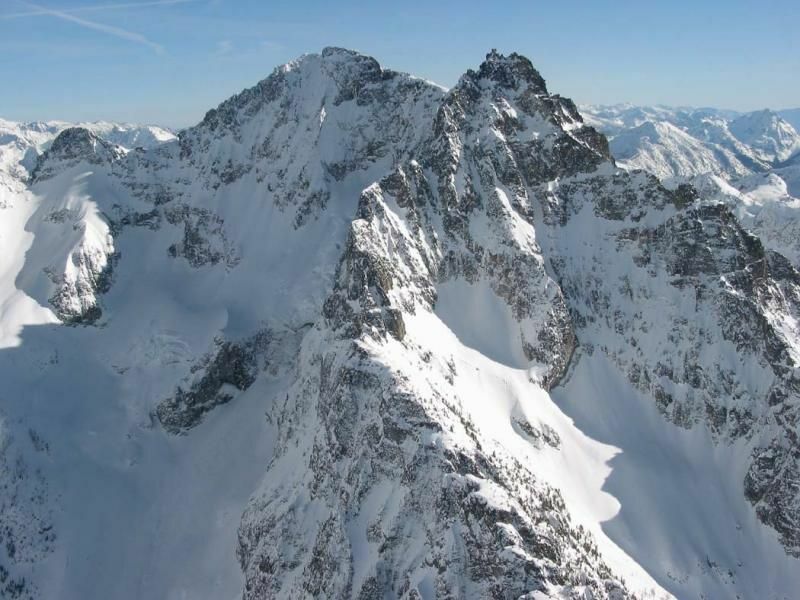 That is amazing ski.......it gives me vertigo just looking at the pictures! Yeah, I can ski that, but only if I knew I had more than one life to spare. Maybe in my next life. It's one thing to be able ski the steep and exposed terrain, but it adds a whole new element when you've got hours of climbing behind you and got to have enough energy reserves to ski the terrain without incident. Great work!